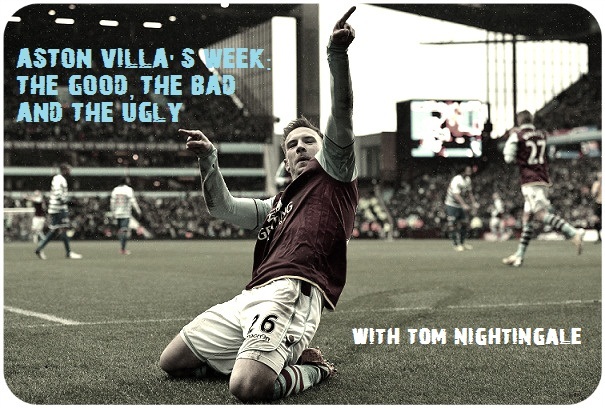 The Good, Bad and Ugly – Aston Villa Reach Vital Turning Point? Villa have shown promise since the disappointing Christmas fixtures, with four points from three tricky Premier League matches. Here’s a look at the Good, Bad and Ugly of Aston Villa’s January so far. The Sunderland result was massive. Just one point from the previous five games left Villa in 13th but just four points clear of the relegation zone, and of the teams below us Fulham and West Brom won while Norwich and Crystal Palace gained a point each from their game. The game wasn’t pretty by any means, and we have Lee Cattermole to thank for Gabby’s well-taken winner. Let’s be honest, Sunderland looked as poor a side against us as there has been in the Premier League in recent years, but a young Villa team in poor form still had to go and get a vital win. Villa were also coping – competently if not comfortably – with Arsenal in the following league game two weeks later until the minute of madness not long after the half hour. Another huge plus for Villa arrived with the return to goalscoring form of Christian Benteke. The Belgian scored his first goal since 14 September to half the deficit against the Gunners and added a second in six days in the draw at Anfield. With Benteke needing to stake his claim to a starting spot up front for Belgium ahead of the World Cup, we can only hope for a repeat of his goalscoring form in the last few months of last season. Gabby has also raised his game in recent weeks since taking his goals well against Swansea and Sunderland, and was the chief architect of Villa’s in the first half at Anfield, tormenting the Liverpool defence and providing the assists for Andreas Weimann’s opener and Christian Benteke’s strike. Villa might have conceded at a terrible time to allow Liverpool back into the game, but the equaliser only came from a Luis Suarez special. Villa were far and away the better side during the first 45 minutes. The signings of Grant Holt and Ryan Bertrand have both improved the Villa squad. I am aware that with Holt there has been a great deal of unhappiness from Villa fans, and had we signed him on a deal which incurred any real kind of risk to club then I would agree. However, on a loan until the end of the season he is a useful replacement for the injure Libor Kozák and if he scored even one decisive goal for the club, then his signing will have paid off. Far less dubious is the signing of Ryan Bertrand. Paul Lambert’s left-back signings have not been too impressive so far, but Bertrand is clearly an excellent player and looked a cut above on his debut at Anfield. Villa have shown spirit, fight and quality in recent weeks, and this needs to be taken into the home clash with West Bromwich Albion on Wednesday night, a game that Lambert and his team must be looking to win. On a final note, it is worth taking the time to commend Thomas Hitzlsperger for having the bravery to go public with his sexuality. Der Hammer has always seemed an excellent role model, and you can only hope that others follow his example in the future. Libor Kozák’s injury was a terrible blow for Villa. He may not be the most technically gifted of footballers – he definitely isn’t – but four goals in only eight league starts for the club is not a bad record and most of his goals have been important; the winner at Norwich and Villa’s second in the 2-0 win over Cardiff and the 2-3 win at Southampton. Grant Holt in on loan does make sense as a temporary replacement, but you just have to hope that this broken leg will not have a long-term impact on Kozák’s career. Apologies for going on about it, but we’re still waiting for that creative midfielder. Fair enough if Lambert wanted to sign Wes Hoolahan from his previous club, but the club’s pursuit of the Norwich midfielder has been poorly-handled. The reported initial offer of £750,000 was never going to be accepted by the Canaries and things have got messier and messier with Norwich’s clear intention to sell to anyone but Villa and Hoolahan’s rejected transfer request. The time to move on to new targets has long passed. This column has managed to overlook the Sheffield United cup defeat until now, but there’s only one heading that match deserves to be filed under. Lambert’s Villa love a lower league cup defeat; Bradford in the League Cup semi-finals and Millwall in the FA Cup fourth round last January, and now Sheffield United this January. First came Lambert’s comments about Villa being able to do without in the FA Cup. In itself, I do not necessarily see the problem with this – it is entirely true that the focuses of most Premier League clubs are on their league campaigns. The disappointment comes from Villa being thoroughly mediocre or indeed worse for most of their league campaign, and in their so-called ‘respite’ from the league being dumped out of the cup by a team 51 league places below us at the time. Lambert even picked a strong team after those comments and we still lost – pretty much the most humiliating outcome there could have been from the situation. The only positive was Nicklas Helenius emerging from the shadowy corners of the Villa substitutes’ bench to score his first Villa goal. The lack of opportunities afforded to the Dane by the manager who signed him has been puzzling, especially considering Benteke’s four months of virtual absence from the team and Andi Weimann’s thoroughly unimpressive season so far. Hopefully the striker will make more appearances from the bench in the next few weeks and months. Lambert, Lerner, Faulkner and co. have five days left to add to Villa’s inexperienced squad before the transfer window shuts as Villa embark upon a distinctly winnable run of games in the next few weeks starting with West Brom on Wednesday. Win that, and the club could be sitting comfortably in 10th going into February.